Three sections featuring new jade hand carved eternal knot globes are surrounded by new jade faceted ellipses and flat sculpted nuggets and set into this opera necklace of smooth rock quartz crystal spheres. Faceted rock quartz crystal ellipses and drum-cut rondelles serve as accents. 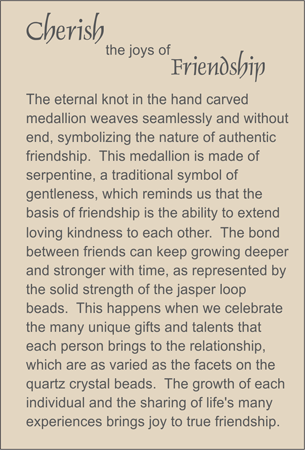 The eternal knot signifies the unending nature of relationships based on love.